Tameson offers a suitable pressure gauge for every pressure measurement. A pressure gauge is an instrument that measures the pressure of a gas or liquid in a system. Most pressure gauges (sometimes referred to as manometer) show the pressure via a needle stroke on a dial. The first step is usually to determine the minimum and maximum working pressure. Tameson has solutions for vacuum, low pressure and high-pressure systems. As a rule of thumb, choose a pressure gauge in which the operating pressure is not higher than 75% of the maximum scale value, for pulsating pressures 65% applies. The pressure is usually indicated in bar or psi and there are different accuracy classes (KL) that indicate the maximum deviation. An accuracy class KL of, for example, 1.6 means a maximum deviation of 1.6% (positive or negative). There are various mounting options, such as a horizontal or vertical threaded connection (bottom or rear connection) or panel mounting. In addition, you can choose from different sizes of pipe connections, cabinet sizes and materials. Choose an oil-filled (glycerin) pressure gauge for pulsating pressures or vibrations. The oil dampens the vibrations, indicating an average constant value. By far the most standard pressure gauges make use of the tube spring principle. This principle is also called 'Bourdon'. A small curved tube in the meter becomes less curved with increasing pressure and this small movement is converted via a mechanism to a needle deflection. For aggressive, viscous or contaminated media media, there are membrane pressure gauges. Special versions are available for special requirements. Examples include differential pressure measurements, additional safety functions such as blow-out, digital readout or integrated pressure switches. If you have any questions, please contact Tameson technical experts. 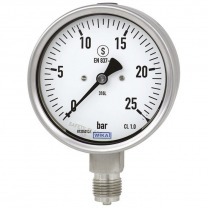 For a further explanation of measurement methods for pressure, available options and standards such as EN 837-2, you can consult the article about pressure gauges.